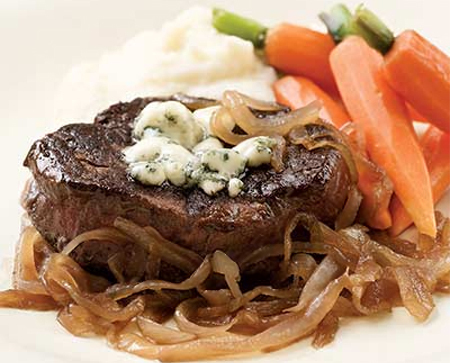 Steak grilled to perfection and topped with sweet caramelised onions and salty Gorgonzola or blue cheese. Serve with garlic mashed potatoes and steamed carrots. 1. Heat 1 tablespoon oil over medium heat in a large frying pan. Add onions and brown sugar and cook, stirring often, until the onions are very tender and golden brown, about 15 minutes. 2. Add stock, vinegar and 1/4 teaspoon salt and cook, stirring, until the liquid has almost evaporated, 3 to 4 minutes more. 3. Transfer the onions to a bowl; cover to keep warm. Clean and dry the pan. 4. Sprinkle the remaining 1/4 teaspoon salt and pepper on both sides of each steak. Heat the remaining 1 tablespoon oil in the pan over medium-high heat. Add the steaks and cook until browned, 3 to 5 minutes. Turn them over and top with cheese. Reduce heat to medium-low, cover and cook until the cheese is melted and the steaks are cooked to desired doneness, 3 to 5 minutes for medium-rare.